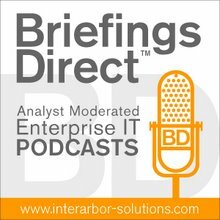 Dana Gardner's BriefingsDirect: Windows losing ground to Linux clients -- how far off can the servers be? Windows losing ground to Linux clients -- how far off can the servers be? Martin LaMonica at CNET has a blog on a new Evans Data survey that shows erosion on developer allegiance to Windows client ports. This makes for some interesting reading, along with the comments. I wonder who sponsored, if anyone, the survey. I can't vouch for the survey integrity, but the findings jibe with what I'm seeing and hearing -- only I think the erosion trend is understated in this survey, especially if global markets are factored. I think too that this represents more than a tug away from Windows purely by Linux clients, and may mask the larger influence of open source more generally, as well as virtualization, RIAs, Citrix, OS X, and SaaS. The impact of SaaS in particular bears watching as more ISVs adopt on-demand approaches as their next best growth opportunity, even though they will still have a Windows port. SaaS, not Linux, is the slippery slope that will affect Microsoft most negatively over time. Go to SaaS fully and forget the client beneath the browser. Those ISVs that remain exclusive to rich Windows clients alone for deployment won't for much longer, even as they continue to use Microsoft tools and servers. I wonder what the percentage of ISVs that ONLY go to market via Windows rich clients is, and how that has tracked over the past five years. If ISV developers can satisfy the need for being on those Windows clients via the browser or RIAs alone, and as more users look to browsers as the primary means for applications access, the need to use Windows on the development and deployment side could sizably slide, too. It's the same threat Netscape represented more than 10 years ago ... it just took some time. Pull the finger from the dike ... and the gusher begins to promote the flood. SOA has an influence here too. When any back-end platform can be used just as well to support the services that can be best integrated, orchestrated, and extended into business processes -- watch out. Choices on deployment for consolidation and virtualized environments moves swiftly to a pure cost-benefit analysis -- not based on interdependencies. Windows on the server will have to compete with some pretty formidable deployment options. When such a tipping point would occur -- whereby the browser or standards-based approach to clients/mobile/services grows such that the back-end choices shift to low-cost, best-of-breed alone -- remains an open question. When you break the bond to client, however, how far off can the server choices shift fully to what's most economically attractive?